Cold cases were always a challenge, but this one had the added folklore factor. The story had been told and retold so many times that people didn’t want an answer—outsiders, that is, people who weren’t involved; that the mystery was unsolvable was part of its appeal. But it hadn’t been witchcraft or magic, and children did not spontaneously dematerialize. What a great book this was! I hadn’t ever read a novel by Kate Morton before so I never knew that she was a popular author in Australia. 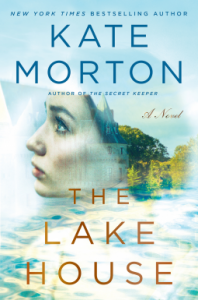 Kate Morton can definitely write, and she sure shows it in The Lake House. This is probably one of the best historical mystery novels that I’ve read in a long time. The concept is great, and I found that I liked the way the author told the story. Yes, it’s not for everyone, but it worked for me. The Lake House jumped from early 1910’s London and Cornwall, where we read mostly from Eleanor’s perspective (LOVED her by the way) to 1930 Cornwall and the disappearance with Theo, all the way to the present 2003 London and Cornwall. If you don’t like constantly changing time periods, then this isn’t for you. Yes, the novel felt slow at times, but I was still flipping the pages. Every time I would read something new my heart would break for the characters. But, my favorite, favorite, character who I would reread about again and again was Eleanor. God, I felt for Eleanor so much it made my heart hurt. When I finished reading The Lake House, she was the one who stayed with me. Passionate and honest, the letter provided such a strong insight into Eleanor’s character that Sadie could almost hear the other woman’s voice, clear and true, across the passage of ninety years. This book, like I said before, is pretty slow and complex. It has many layers into its story and a lot of things that the reader needs to understand to fully grasp the story. The only reason this wasn’t a five star rating was because the ending was so convenient and fairytale-esque that it made me cringe and shudder. Not the kind of ending I expected from the tone of the story, but it wrapped up things nonetheless. Although not for everyone, a great and complex read that read like a family saga sometimes with a good mystery aspect, an extremely well done historical setting, and characters that stayed with me afterward.